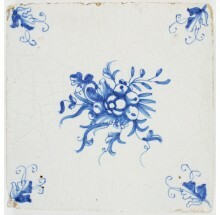 In the sixteenth and seventeenth centuries the demand for still-live paintings increased, influencing the painters of Delft tiles. 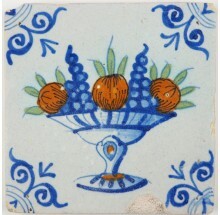 Around that time more and more tiles were decorated with fruits and foliage, such as grapes, pears, apples and leafs. Symbolism plays an important role in their popularity, as the grapes were not only a symbol for fertility, but were also associated with virginity. Easy recognizable is the use of a lot of orange, which refers to the 'House of Orange', better known as the Dutch royals. 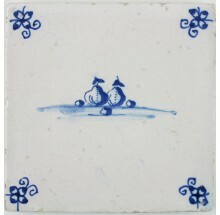 Make sure to check out our Delft wall tiles in this category as well. 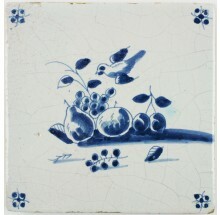 If you have any questions about Delft tiles fruits and foliage, or if you are looking for a specific kind, please do not hesitate to contact us. Click here to visit our contact page.